The US equity markets are on a roll. Today, the S&P 500 hit an all time high, just weeks after the Dow also broke its record. While it has been less than five years since the crisis of 2008 and the epic collapse of equities in the last quarter of that year, the returns earned by those who stayed the course, even relative to pre-crisis price levels, is a testimonial to the dangers of staying out of equity markets for extended periods. As with every other market surge, this one has brought with it the usual questions: Have stocks gone up too far, too fast? Are we due for a correction? Should we stay in the market or take profits? I could cop out and use the excuse that I am not a market timer, but that would be a lie. All investor are market timers, with the differences being one of degree. So, the honest truth is that I have a view about markets but that it does not dominate my investment decision process. Cash returned to equity investors: Ultimately, we buy stocks to get cash flows in return, with those cash flows evolving over the last three decades from almost entirely dividends to a mix of dividends and stock buybacks. Holding all else constant, the more cash that is returned to investors in the near term, the more you will be willing to pay for stocks. Expected growth: The bonus of investing in equity, as opposed to fixed income, is that you get to share in the growth that occurs in earnings and cash flows in future periods. Other things held equal, the higher the expected growth in earnings and expected cash flows, the higher stock prices should be. Risk free rate: The risk free rate operates as more than base from which you build expected returns as investors. It also represents what you would earn from investing in a guaranteed (or at least as close as you can get to guaranteed) investment instead of stocks. Consequently, stock prices should increase as the risk free rate decreases, if you hold all else fixed. Risk premium: Equities are risky and investors will demand a “premium” for investing in stocks. This premium will be shaped by investor perceptions of the macro economic risk that they face from investing in stocks. If the equity risk premium is the receptacle for all of the fears and hopes that equity investors have about the future, the lower that premium, the more they will be willing to pay for stocks. Note that while it is easy to focus on each of these variables and draw conclusions about the impact on stock prices, they tend to move at the same time and often pull in different directions. For instance, stronger economic growth will push up earnings growth but interest rates will usually go up as well. In a similar vein, paying out more in cash flows to investors in the current period will often mean less being invested into businesses and lower growth in the future. It is the trade off that determines whether stock prices will go up or down as a consequence. On each of these variables, the US equity market is looking at "good" numbers right now: the cash returned to investors by US companies has rebounded strongly from post-crisis lows, earnings growth is reasonable, the risk free rate is at a historic low and the equity risk premium, while not quite at pre-crisis levels, has declined significantly over the last year. To explore both where we are and the potential dangers that we face as investors, let’s take a look at each variable. a. Background: Until the early 1980s, the primary source of cash flows to equity investors in the United States was dividends. As I noted in this post from a while back, US companies have increasingly turned to returning cash in the form of buybacks. 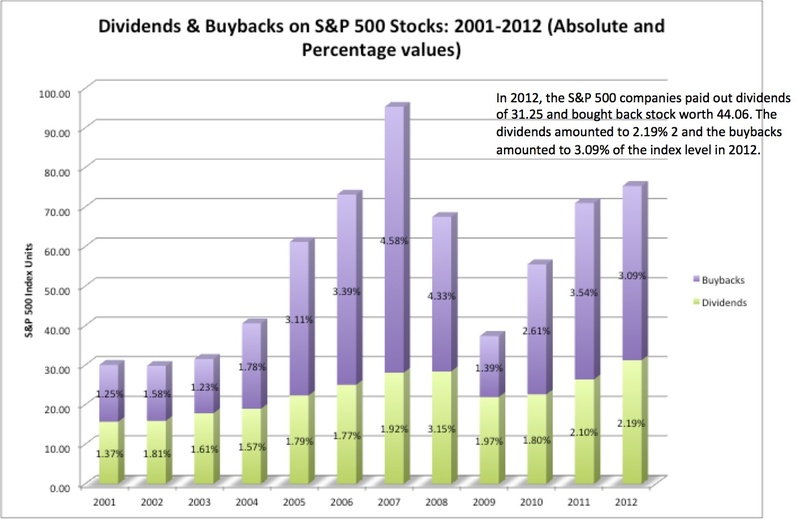 While there are some strict value investors who believe that dividends are qualitatively better than buybacks, because they are less volatile, the aggregate amount returned by US companies in buybacks is too large to be ignored. Over the last decade, buybacks have been more volatile than dividends but the bulk of the cash flows returned to stockholders has come in buybacks. b. 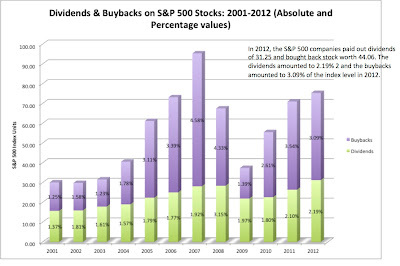 Level: In the most recent twelve months for which data is available (through December 2012), the companies in the S&P 500 bought back almost $400 billion worth of stock, much more than the $270 billion that they paid out in dividends. In terms of index units and as a percent of the level of the index, the aggregate cash flows have recovered fully from their post-2008 swoon. c. Sustainability: While it is good that cash flows are bouncing back, we should worry about whether companies were over reaching and paying out too much in 2012, perhaps in advance of the fiscal cliff at the end of 2012, in which case you should expect to see a drop off in cash flows in the near term. There are three reasons to believe that this is not the case. First, as Birinyi Associates notes in this blog post, the pace of buybacks is increasing in 2013, not dropping off, with the buybacks authorized in February 2013 at an all-time high. Second, the cash returned in 2012 may have been a historic high in dollar value terms, but as a percent of the index, it is close to the average yield over the last decade. Third, the aggregate cash balances at the S&P 500 company amounted to 10.66% of firm value at the end of 2012, suggesting that companies have cash on hand to sustain and perhaps even increase cash returned to stockholders. While a portion of this cash is trapped, it is possible that corporate tax reform, if it happens, will release this cash for distribution to stockholders. a. Background: For dividends and buybacks to continue to grow in the future, there has to be growth in earnings. While that growth can be estimated by looking at history or by tracking analyst forecasts of earnings for the individual companies, it has to be earned by companies, reinvesting their earnings back into operations and generating a healthy return on equity on those investments. Thus, while history can sometimes yield skewed values (up or down) on growth and analysts can become overly optimistic or pessimistic, the intrinsic growth rate will be grounded in reality. b. Level: To look at earnings growth in the S&P 500, lets begin by looking at history. In the table below, we report on earnings growth rates over 5 years, 10 years, 20 years and 50 years in index earnings. Over the last 5 years, the compounded average annual growth rate in aggregate earnings for the S&P 500 has been 4.42%. As the most widely followed index in the world, analyst estimates of growth in earnings are widely available both for individual companies in the S&P 500 index and for aggregate earnings in the index. Using the former to construct a bottom-up estimate of growth yields 10.57% as the expected growth rate in March 2013. Since there is evidence that analyst estimates of growth are biased upwards at the company level, we also looked at the “top down” estimates of growth that analysts are forecasting for aggregate earnings in March 2013, obtaining a lower growth rate of 5.33% a year for the next 5 years. While this number is lower than the top-down analyst estimate of growth, it is within shouting distance of the estimate. There is, of course, a concern that some investors and analysts have voiced about the operating earnings number reported for the S&P 500, arguing that it is over stated. If it is, then the equity reinvestment rate and ROE are both over stated, and the expected growth rate will be lower. a. 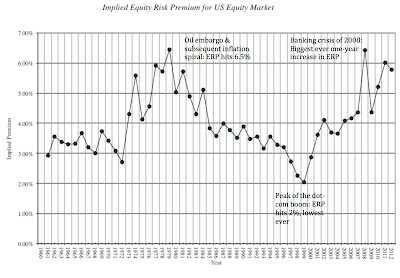 Background: Put simply, the equity risk premium is the market price of equity risk. It is determined on the one hand by perceptions of the macro risk that surround investors, with greater risks going with a higher ERP, and on the other hand by the collective risk aversion of investors, with more risk aversion translating into a larger ERP. A larger ERP implies that investors will pay lower prices for the same set of equity cash flows. The conventional wisdom that this number is stable in mature markets was shaken by the banking crisis of 2008, as premiums in the US and European equity markets experienced unprecedented volatility. The implied ERP at the start of 2013 was 5.78%, lower than the ERP at the start of 2012, but still at the high end of the historical range. c. Sustainability: I have been estimating the monthly ERP for the S&P 500 since September 2008, and as can be seen in the figure below, the premium of 5.43% at the start of March 2013 represents a significant decline from a year ago. Note, though, that it is still much higher than the premium that prevailed in September 2008, just prior to the crisis. 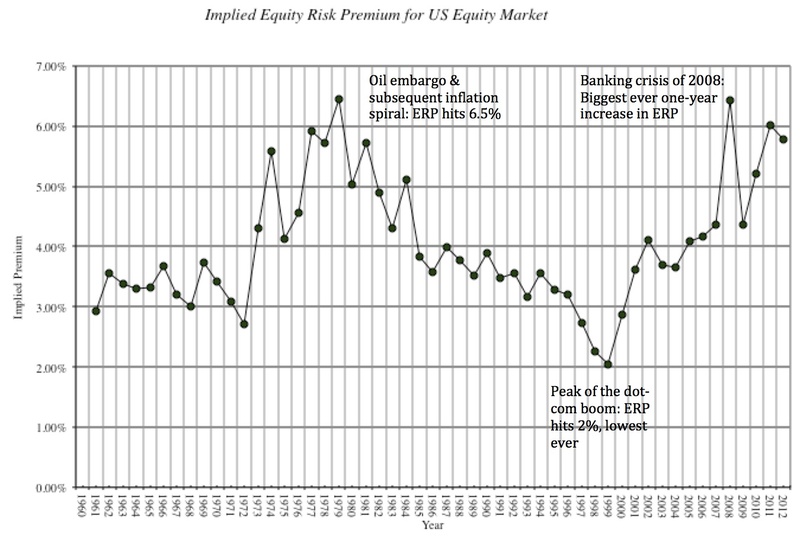 In fact, the average implied ERP over the last decade has been 4.71%, lower than the current implied ERP. a. Background: As sovereigns increasingly face default risk, it is an open question whether any investment is risk free in today’s environment. However, for an investor in US dollars, the return you can expect to make on a long term treasury bond not only represents a base from which all other expected returns are computed but is an opportunity cost of investing in something risk free instead of stocks. b. 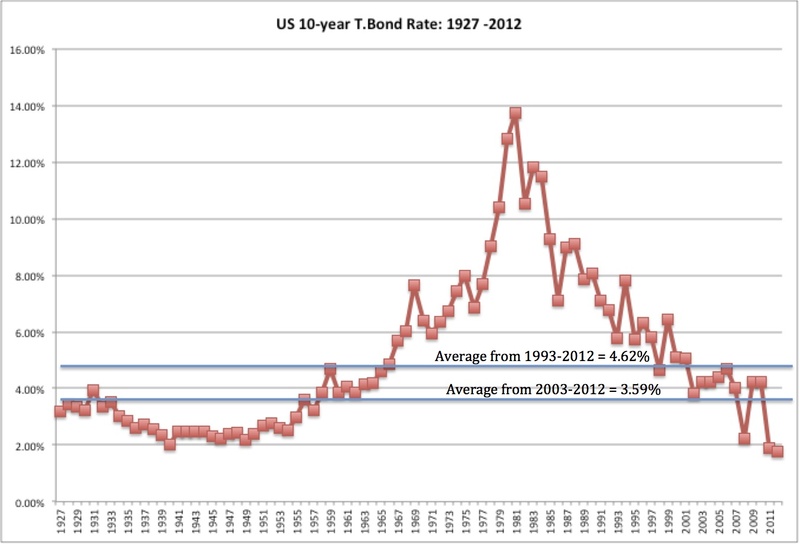 Level: By any measure, risk free rates are at historic lows in much of the developed world. On March 26, 2013, the ten-year US Treasury bond rate was at 1.91%, well below where it stood prior to the last quarter of 2008 and well below rates that prevailed a decade earlier. 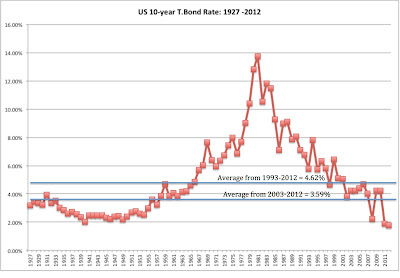 c. Sustainability: Is the treasury bond rate destined to rise and if it does, will it bring down stocks? To answer this question, we have to look at what has kept rates low for such an extended period. While the answer to some is that it is the Fed’s doing, I, for one, don’t attribute that much power to Ben Bernanke. The Fed has played a role, but it has succeeded (if you can call it success) only because inflation has been benign and real economic growth has been abysmal for this period. There are at least four scenarios that I see for the future direction of interest rates, with differing implications for stocks. If economic growth translates into earnings growth, neutral. If not, mildly negative. Negative. Higher required returns on stocks, no offsetting positive. If you believe that the Fed can keep a lid on interest rates, as economic growth returns, the outlook is positive for stocks. I think that the most likely scenario is that the interest rates will rise as the economy improved, and the outlook for stocks will depend in large part on whether earnings growth picks up enough to offset the interest rate effect. Based upon my assumptions, the market’s current winning ways can be justified. Replacing the current implied equity risk premium with the average premium over the last decade (4.71%) yields a level of almost 1800 for the index, and using the analyst-estimated growth rate will make it even higher. Higher risk free rates have a negative, albeit muted, effect on value, if accompanied by higher growth rates, but do have a much more negative impact, if growth rates remain unchanged. You may have very different views on the market drivers and if you are interested, you can input your numbers into the attached spreadsheet to get an assessment of value for the S&P 500 index. When stocks hit new highs, the natural impulse is to look for signs of over valuation, but there are good reasons why US stock prices are elevated: cash flows are high, growth looks good, the macro risks seem to have faded (at least some what) and the alternatives are delivering lousy returns. In the near term, stocks remain vulnerable to two possibilities. One is that another macro crisis will pop up (Italy, Spain, Portugal or a non-EU black sheet) that will cause equity risk premiums to jump back to the 6%+ levels that we have seen so often in the last 5 years. The other is a sudden surge in interest rates, unaccompanied by better earnings or higher earnings growth. Since all risky asset classes (corporate bonds, real estate etc.) will be also adversely affected by either of these developments, I don't see much point to shifting from equities to other risky assets to protect myself against these risks. I could, of course, choose to stay in cash, but as the last 5 years have indicated, waiting for the "right time" to invest can leave you on the sidelines for too long. So, I am going to stop worrying about the overall market and go back to finding under valued companies. Marty Lipton: Shareholder Champion, Stakeholder Protector or Management Tool? I do not personally know Marty Lipton, nor have I met him. Based on what I have read about him and by him (he is a prolific writer), he strikes me as an extremely competent lawyer and he is certainly a good friend and champion of New York University (the institution that I teach at), chairing the board of the trustees for the university. I have never, though, thought of him as a champion of long term shareholders in publicly traded companies, which is the role he plays in a recent article by Andrew Sorkin in the New York Times. The article itself was precipitated by a post, titled "Bite the Apple, Poison the Apple", by Mr. Lipton in the Harvard Law School Forum on Corporate Governance and Financial Regulation, where he argued that the threat to the company from activist shareholders (and David Einhorn, in particular) should serve as a clarion call for action to deal with the misuse of shareholder power. I am not sure what powers Mr. Einhorn misused in making his case that Apple should do something with its cash, but knowing Mr. Lipton's views on corporate governance (which is to side with incumbent managers, no matter what), I was not surprised by the article, but I was that it was picked up in the New York Times by Sorkin. In his article, Sorkin implicitly accepts Lipton's view that activist investors are short term, that they do damage to companies by being vocal and that long term shareholders are not served by activism. I think he is wrong on all three counts. To address the question of whether activist investors are interested in the long term, Sorkin quotes Leo Strine, the Chief Judge of the Delaware Court of Chancery, who seems to have seen evidence to conclude that "the answer is usually no". I consider myself to be a long term shareholder: I do my homework before buying the shares and I have a median holding period of eight years. I don't operate under any illusions about what drives activist investors to do what they do, which is the desire to make money on their investments (and who does not?). However, I have not seen any evidence that would lead me to believe that activist investors are any more short term than any other group of investors, and there is, in fact, evidence to the contrary. Holding period: The studies that I have seen of both institutional activists (holding period of about 20 months, on average) and individual activists provide evidence that they hold their investments for longer than their passive counterparts. In fact, Sorkin undercuts his argument that stockholders are short term by noting that Nelson Peltz has been a stockholder in Heinz for more than six years, Bill Ackman is a long term investor and director at JC Penney and David Einhorn has held Apple stock for many years. Cash focus: It is true that activist investors often push for companies to return more cash to stockholders, either as dividends or in stock buybacks, but why is this evidence that they are short term? Assuming that companies that reinvest money back into their own businesses are more long term than companies that return cash makes no sense, if these companies operate in bad businesses. The companies that are typically targeted by activists are mature companies that have cash surpluses and relatively few investments and returning cash back to their stockholders strikes me as exactly what investors would want them to do. It is possible that Judge Strine was misquoted on his claim that activist investors are usually short term, and if so, he should set the record straight. It is also possible that he has evidence to back his claim, and if he does, I would love to see it. There is a third possibility that he was engaging in some casual empiricism, which we are all inclined to do now and then, but is a dangerous practice, if you are the chief judge in one of the most powerful courts (at least when it comes to business law) in the country. Sorkin is disturbed by the use of the media by activists to make their case for change, and that the change that they are pushing for may not be the "right" change for other shareholders in the long term. I don't share his trepidation about either one. As a long term investor who is looking for price catalysts, I envy the megaphones that activist investors have to broadcast their views and be their own catalysts. Not also that activist investors are not alone in using the media to make their cases. In fact, the media's favorite long term investor, Warren Buffet, has never been shy about using the media to good effect to generate returns on his investments. Do private equity investors push for changes that may not be in sync with long term stockholders? Sure! I have argued that activist investors are often too focused on "financial' value creation and too little on "operating" value creation. However, it is a leap from there to claim, as Mr. Lipton has, that David Einhorn does not have the right to make his argument or that doing it in public is somehow damaging to Apple. As a shareholder, he has every right to make his case and the rest of the shareholders have the right to decide whether they agree with his proposal or with incumbent managers (who may oppose it). You don't have to believe that managers are always wrong and activist investors are always right to also believe that it is healthy for everyone concerned for managers to have to explain what they are doing to stockholders. If managers are credible (and their track record will play a role in this) and can make a good case that they are right (and activist investors are wrong), they stand a good chance of winning over stockholders to their side. If managers are not credible and/or refuse to make a case for their actions, I think that stockholders will and should be more receptive to activist investors' suggestions. As a shareholder in any company, I welcome the appearance of an activist investor (or two) into the shareholder ranks. The game, as it is structured, is tilted in favor on incumbent managers. Activist investors, motivated as they are by self interest, help to shift the balance back (even if it is only a little bit). In fact, in the absence of activism, you can rest assured that boards of directors will continue to be rubber stamps for CEOs pushing through their own agendas, aided and abetted by an ecosystem of lawyers, bankers and consultants who make money of the status quo. And the status quo stinks at many companies, with about third of all publicly traded companies actively destroying value for their owners. (I will back this up in a future post) It is these companies that are disproportionately targeted by activist investors and deservedly so, and long term stockholders welcome them, for the most part. In fact, the evidence suggests that stock prices at companies targeted by activist investors go up on the announcement of the targeting, and stay up for the long term. As for Mr. Lipton, he has either created or had a hand in creating some of the worst abominations in corporate governance. From fathering the "poison pill" to arguing that stockholders should have no say on CEO pay, he has been on the management's side of every corporate governance issue over the last three decades. In fact, reviewing his briefs over the years, it is clear that his problem is not with activist investors but with any investors who deign to question management motives or actions. To Mr. Lipton, the only good stockholders are masochists, who takes the punishment that is meted out silently, raise no protests and vote with their feet. As a stockholder, I would rather have David Einhorn, at his worst, on my side than Mr. Lipton at his most magnanimous. To argue, as Mr. Lipton does in his brief on Apple, that his entreaties on part of management are in the best interests of long term stockholders is analogous to making a case that Marie Antoinette was really championing the cause of French bakers when she supposedly asked her starving populace to eat cake. What about the other stakeholders in the firm? When apologists for management use the interests of other stakeholders as their shield against accountability, I, for one, take it for it is, a smokescreen. I don't believe that managers who insulate themselves against stockholder pressures care about protecting the interests of employees, customers or society. In fact, I will wager that these managers will use the same "other stakeholder interests have to be served" excuse with each of these groups, while the only interest group that is finally served is their own. In fact, I think that the company that Mr. Lipton focused on, in his post, Apple, illustrates my point. I love the company and its products but as a stockholder, I have become increasingly frustrated with its managers, in general, and Tim Cook, in particular. In fact, I am not alone, since a third of the stockholders at the annual meeting a short while ago voted against his pay package. As I see Mr. Cook go from forum to forum, saying nothing of substance and wreaking havoc on the stock price almost every time he talks, I want more activism, not less. Managers at public companies are human, make mistakes, and are often unwilling to change their minds (or ways) without pressure from stockholders. The boards of directors at these companies, in spite of all of the corporate governance legislation passed in the last few decades (or perhaps because of the legislation) tend to go along with incumbent management, unless pushed to act. That push will not come from traditional institutional investors, who are too timid or lazy to challenge the status quo, and the small shareholders (long term or short term) have little chance of being heard. Without activist investors rocking the boat, who is left to challenge managers to explain their actions?